Denise James is assistant professor of philosophy at the University of Dayton where she facilitates the Diversity Across the Curriculum program. She teaches courses in contemporary social and political philosophy. She is currently working on a monograph about urban divestment and the possibility of justice in U.S. cities in a post-industrial age from a pragmatist perspective. 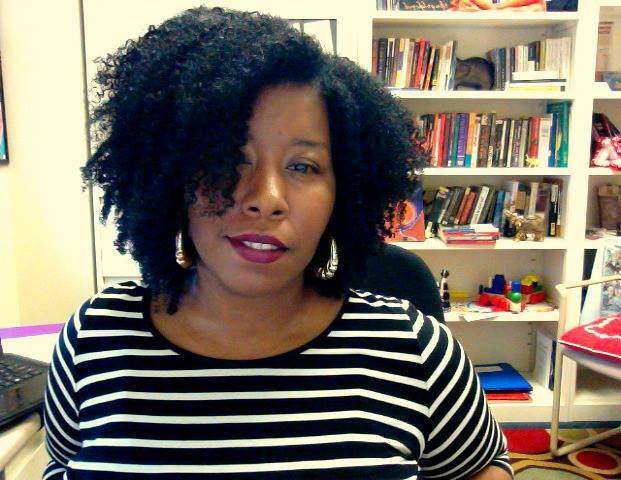 She has published on the intersections of classical American pragmatism and black feminist philosophy. One of her latest projects is on the radical habits of Angela Davis and John Dewey. Thank you, Meena, for the invitation and for maintaining such a great series. As I’ve followed along, I’ve been really enthralled with how people are describing how they came to their current projects. With that I mind, I hope my conversational contribution here is both appropriate to the invitation and interesting to the readers of the blog. August 5th is my birthday and on that day in 2008 I was a brand new resident of the city of Dayton. I’d move to the city to begin my job at the University of Dayton and knew next to nothing about the town or the university. I woke up to happy birthday wishes from friends and family far away from my loft in downtown Dayton on social media. Everyone wanted to wish me good luck on my move and new job. One great friend also left a link with her well wishes. Forbes magazine had posted an article about “America’s Fastest Dying Cities,” my new city had made the list, along with three other cities in Ohio. In the days that followed new colleagues posted the local response to the Forbes article and old friends wrote, called, and messaged to inquire about the viability of my new city. Was Dayton dying? Could a city die? What did that mean for the people who lived there? As a black feminist pragmatist philosopher interested in questions of social justice, political geography, and subjectivity, the dying city posed a series of problems for me that I could not get away from as hard as I tried to that warm August birthday the month before my first job post grad school was set to begin. I spent that day reading at the picturesque Riverscape Park that I was just a few blocks from where I lived and made plans to hang out with new friends at a local night spot. During a friendly tour of one of the city’s historic neighborhoods and over watery drinks at the club, the pending death of Dayton was the choice topic of conversation. Friends I’d met in my building, most of whom were black and had grown up in the city, seemed to agree, the city was dying. Downtown, where we lived, had not become the great mecca of urban professionals the developers of our loft building had hoped. There was no close grocery store to us and in spite of some swank restaurants and the beloved minor league baseball team’s stadium being in walking distance, downtown had suffered the losses in population and industry as hard as the rest of the city. Vacant housing and businesses were the norm not the exception. Unemployment and homelessness were high. We talked about failing school districts and the paring down of government services. Friends associated with the university were almost univocally convinced that the city, although it was experiencing population decline and had lost most of its major manufacturing employers, was not dying. They pointed out that local health networks, the U.S. Air Force base, and our employer, the private Catholic university, were all thriving. There were plans! The city would be restored. In the coming months and years I would sit in audiences and attend meetings where members of the city council and university related officials would talk about all of the ways Dayton was not dead or dying, all of the ways it would be restored to full health. Local news, radio, and print media ran stories about efforts citizens and businesses were making to rethink what Dayton would be as a city. And all the while I wondered, sometimes aloud, if perhaps the city was being remade with the needs and aspirations of the current residents in mind. It seemed a lot of the efforts, both rhetorical and strategic, focused on attracting new residents to the city and not necessarily on how those efforts would affect those inner city, poor and working class, people who lived there. It seemed lots of people were just assuming that the influx of new residents would have a helpful, trickle-down effect on the old. I started thinking about how many of these conversations posited as ideal, types of citizens who lead types of lives that didn’t seem to match the people who I knew and encountered every day in Dayton. Many of these people were not the newly unemployed but had experienced job loss decades before. Generational poverty, inadequate housing, and a city with a history of segregation that still marks the sides of town as white and black are the context of many peoples’ lives in this city and many others. Plans to open the city to new migrants and revitalize by being a mecca for small manufacturing seemed like good ideas but I kept worrying about those folks whose identities weren’t stereotypically prized for the industriousness or whose pedigrees wouldn’t land them jobs at tech startups. As a black feminist pragmatist, issues of race, class, gender and the real problems of how to support people in a city with the problems like we face in Dayton nagged me daily. What would it mean to take as our starting point, not the college educated professional as who we are reviving the city for, but the young Appalachian or Black mother who must find work and build a life in our city? What sort of recommendations about the use of space, transportation, the responsibilities and benefits of city life would we come up with if her lived experience was the check of our efforts to enliven the city? These are normative, philosophical questions. They cross the disciplinary borders of geography, political science, legal theory, and ethics. They require us to articulate problems, posit solutions, and perhaps most importantly, these questions seem to stretch our imaginations about what a real future could look like in our post-industrial era. Without getting into too much of a discussion about what academics in general, and philosophers, in particular, think they are doing or can do, when it comes to public issues and problems, I’ve had the occasion to think about why I might be a good person to write a book about social justice and the dying city – because of two four year olds asking the same question, at two different times. Recently, upon hearing my title, my own daughter and the daughter of a colleague in philosophy, each wondered aloud, “What’s the use of being a doctor if you can’t help anybody?” Both girls were referring to the fact that I’m not a medical doctor. I have the title but do things that seem to be of little use or import to the worlds of four year olds, no matter how much I might want to claim what I do is important! Academic books and articles are read by academics – if they are read at all or so some studies are currently reporting. Why ought anyone care that I wrote a book that used Dayton as a case study for my articulation of views about just cities and participatory geography? What I know is something about power that 4 year olds may not yet have figured out. One of my great sadnesses and responsibilities as a newly tenured professor at the University of Dayton is that I realize how much more social capital and volume my voice on these vital issues potentially has in this place and in this moment than that of lots of other people. With more time and space, I could tell you the stories of how many times discovering I was a UD professor totally changed the attitudes of the person I was talking to because in this moment, in this place, the university that employs me is one of the great hopes of life for the city that some think is dying. Many of my friends and colleagues are doing hard work in the city to make it a place to live that can support the people who need it. In part, my efforts, the writing of a book about these issues, is the least of those efforts. But if the city planners never read my book, if the university officials never once track down my sources and consider their merits, what they will do is pay attention – even if only for a fleeting moment – to the fact that Dr. James has something to say about it (and didn’t she write a book about it?). With that platform, it is my responsibility to the trouble the water a bit for our grand plans of revitalization. I hope, perhaps naively, to be a useful doctor in my still too quiet attempts, to amplify the voices of residents who don’t fit our models, who are working every day to live in a city where the living is hard. I enjoyed reading this. One gets tired of trying to dig through the layers of citations and jargon to figure out what makes a project worth engaging with, and this was refreshingly straightforward. The project looks interesting and valuable, so I hope it goes well.